Each person interested in joining a kayak trip is requested to read this page. Read about inviting a friend or partner. View options for travel to Sandspit. Adventure travel involves changeable elements. These journeys become exceptional when participants are appropriately prepared. Compatibility is uniquely enhanced when group members arrive accurately informed. We offer a wide variety of tours and expeditions for paddlers with different levels of kayaking ability, yet our trips are not suitable for everyone. The information on this page will assist people in developing accurate expectations while making a knowledgable decision. Our tours and expeditions are best suited to participants who are reasonably able-bodied, yet there is no need for our guests to be accomplished athletes. A variety of sea conditions are experienced during our wilderness kayak journeys. Depending on conditions, we launch the kayaks for several hours each day to explore the islands. On calmer days, we venture out to experience some gentle ocean swell and light to moderate winds. A properly loaded single touring kayak can feel predictably stable in moderate sea conditions. When it becomes too windy, we remain on shore; there are many scenic campsites that provide great shelter during stormy days. Our trips also provide time to "simply be" on Haida Gwaii. We cook wholesome slow food over a driftwood campfire while enjoying quiet, unstructured time on shore. We adapt to the pace of the sun and tides, rather than attempt to impose an artificial schedule. Those who become comfortable with "being in the moment" tend to gain more pleasure from our trips, compared to those whose attention may be continually focused on reaching some other destination. We offer several trips suitable for relatively inexperienced kayakers, including our accommodation tours. Previous kayaking experience is recommended; attending a sea kayaking course prior to a trip could provide valuable skills to an inexperienced paddler. We also offer more advanced expeditions specifically designed for kayakers who have accumulated some experience and developed reasonable boat-handling abilities. All our trips are best suited to able-bodied people who prefer to maintain a positive attitude during occasional challenging moments. Those who enjoy our trips the most tend to read our website in detail before making reservations. The "Butterfly way" evolved during more than a quarter-century of paddling on Haida Gwaii; it is a considerate method of wilderness travel, most appreciated by team players. To learn more about our style of travel, prospective tour guests and expedition participants are encouraged to complete the Buttefly way questionnaire. Before making a reservation, please familiarize yourself with the Terms for Cancellations, Transfers & Payments. Even with accomplished paddlers, we ask each group member to cooperate with our professional risk management guidelines. Our groups remain with the guides when on the water; there are very limited opportunities to paddle without the guides. Those who may not appreciate this style of group-oriented risk management are encouraged to consider a self-guided trip. Wilderness kayak journeys are guided camping trips. These experiences are well suited to those seeking a degree of personal challenge; the North Pacific can be an exciting place to explore by kayak. We comply with changing weather and sea conditions. Our groups generally do more kayaking on calm days and less on windy days. Summer storms are possible. If it becomes too windy, we remain on shore. Depending on conditions, we paddle up to five hours in a day. After a couple of hours in the kayaks, we typically go ashore to stretch our legs and enjoy lunch before returning to sea. Accommodation tours provide a "softer" adventure with heated, indoor lodging after each kayak day-trip. These tours are suitable for a wide range of skill levels and preferences; relatively inexperienced paddlers and accomplished kayakers are all welcome, as are those who may prefer not to paddle. We supply single kayaks. Each Butterfly Tours participant is provided with the opportunity to effectively propel their own kayak. Our guides are accomplished kayak instructors; we help people develop efficient paddling techniques. Arriving uninjured, with reasonable balance, reflexes, fitness and coordination will generally enable people to enjoy touring at optimum cruising speed in our single kayaks. Of course, the ability to maintain a positive attitude during challenging moments will also provide a tremendous advantage. Cruising speed is an important concept for each group member to understand. Single kayaks enable specific freedoms while providing certain challenges. Many people distinctly prefer paddling a single kayak; however, not everyone aspires to be responsible for the propulsion of their own vessel. If you are interested in our trips and want to invite a friend, please be sure that your friend also seeks the additional rewards and challenges provided by a single kayak. See more information on inviting a friend or partner. As an alternative, a Seaward Southwind double kayak is available; however, we do not provide a paddling partner for the double. (We provide each person with the opportunity to paddle a single kayak.) If you would prefer paddling our double, please be sure to arrive with a paddling partner. Those planning on arriving alone and preferring to paddle a double kayak may be interested in joining a different tour company that provides a fleet of doubles. You are welcome to contact us for a reference to another outfitter. Our guides promote group awareness and respect; the best interest of the group generally outweighs the desires of an individual. Many people naturally understand and embrace this universal social concept. Unfortunately, a few people seem to reject group consciousness - they may be accustomed to continually getting their own way. Our trips are not likely to fulfill the desires of these few. Team players willingly work in cooperation with others and value a group's interdependence. Most team players entirely appreciate and enjoy the trips we offer. Our food is healthy, tasty and abundant. We cook wholesome slow food over driftwood campfires and enjoy our onshore time. There are many aesthetic benefits to professional campfire cooking. For relatively inexperienced paddlers, as well as accomplished kayakers. This five-day tour is suitable for relatively inexperienced paddlers, as well as accomplished kayakers. Some previous kayaking experience is recommended. Guided kayak day-trips are tailored to the desires and abilities of the group. The kayak guesthouse vacation allows for plenty of flexibility each day. 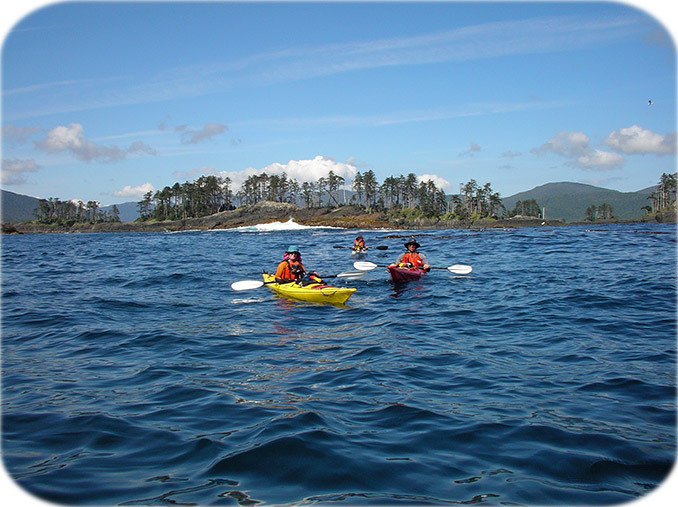 Guests have the option of joining daily kayak excursions, or staying in Rose Harbour to relax at the guesthouse. This vacation is based in the tiny, isolated community of Rose Harbour, which is populated by a handful of friendly maritime homesteaders leading a fascinating, organic lifestyle. For a more "civilized" vacation option, please consider the mothership cruise. The eight-day mothership cruise is suitable for relatively inexperienced paddlers, as well as accomplished kayakers. Some previous kayaking experience is recommended. Guided kayak day-trips are tailored to the desires and abilities of the group. Five guest cabins accommodate up to ten people onboard. Cabins have doors to separate them from the rest of the yacht. Each cabin is equipped with an electrical outlet that may be used for recharging cameras and tablets. There are two heads (toilets), a shower and a roomy galley where delicious meals are prepared. The large main cabin is a common area where everyone can sit comfortably while meals are served. The boat is equipped with a furnace which transports warm, dry air into each cabin. These seven-day & eight-day guided wilderness sea kayaking and camping tours are suitable for relatively inexperienced paddlers, as well as accomplished kayakers. Some previous kayaking experience is very highly recommended. Groups generally progress through relatively calm sea conditions before venturing out to experience more challenging paddling situations. Participants are provided with instruction on efficient kayaking techniques, which can enable each person to self-propel their loaded kayak through moderate sea conditions. With dependable reflexes and practical levels of balance, fitness and coordination, people are generally able to enjoy touring at optimum cruising speed in our single kayaks. View our kayak skills demonstration video on YouTube. This eight-day guided wilderness sea kayaking and camping tour is suitable for relatively inexperienced paddlers, as well as accomplished kayakers. Some previous kayaking experience is very highly recommended. Groups generally progress through relatively calm sea conditions before venturing out to experience more challenging paddling situations. Participants are provided with instruction on efficient kayaking techniques, which can enable each person to self-propel their loaded kayak through moderate sea conditions. With dependable reflexes and practical levels of balance, fitness and coordination, people are generally able to enjoy touring at optimum cruising speed in our single kayaks. This eight-day guided wilderness sea kayaking and camping journey is specifically designed for kayakers who have accumulated some experience and developed reasonable boat-handling abilities. We offer several other tours for less experienced paddlers. Cape Freeman Expedition participants are asked to arrive with the ability to effectively propel a loaded single kayak at cruising speed in a variety of sea conditions. Expeditions are likely to encounter moderate winds, currents and open-ocean swell. The trip may include review of intermediate paddling, manoeuvring and stability techniques. Participants on these expeditions are requested to arrive with the practiced ability to perform the following basic skills in a single kayak: A controlled quick stop, followed by using forward and reverse sweep strokes to pivot 360° in each direction, then paddling straight backwards. Additionally, Cape Freeman Expedition participants are encouraged to become comfortable with rocking their kayak side-to-side while their torso remains still, centred and upright. Practicing this skill can help prevent a capsize while paddling in more challenging sea conditions. Arriving with these abilities can help create a more cohesive skill level within the group. Those interested in this unique expedition are requested to complete the Butterfly way questionnaire before registering. This simple process encourages compatible attitudes and cohesive abilities on our more advanced expeditions. The seven-day Evolution Expedition is an educational adventure. It is not designed as a paddling holiday. Please see the prerequisites. This eleven-day expedition is unlike anything else. The journey is open to experienced kayakers who have previously paddled with us. Our wilderness kayak journeys are designed for participants who are reasonably able-bodied. Dependable reflexes, as well as practical levels of balance, fitness and coordination are necessary, yet there is no need for our guests to be accomplished athletes. Self-propelled multi-day wilderness journeys involve some challenging moments. These moments may not happen each day. When they do occur, the challenges are often quite brief. Many people relish the moments as they arise, some soon consider them a highlight of the trip. Every year, a variety of people enjoy kayaking with Butterfly Tours. Several of our guests are small women in their sixties. Smaller people and less experienced kayakers can enjoy exploring the North Pacific by single kayak, provided they are able-bodied and maintain a positive attitude during challenging moments. Our guides are accomplished kayak instructors, able to assist each guest in developing efficient paddling techniques. Properly utilizing these techniques requires reasonable physical capabilities. Ultimately, openness to learning combined with a flexible, positive attitude can be far more important than a person's previous kayaking experience. Prospective tour guests and expedition participants are encouraged to view our description of cruising speed. Additional information is provided for those inviting a friend or partner. For "softer" adventures, please see our accommodation tours.